1. M-6 interphone suitable for use in a hotel, property, logistics, building, exhibition, event and large and medium-sized industrial enterprise, security and other large stores, the machines can connection turntable, increasing the distance calls, brought two and DCS CTCSS mute the sound, voice encryption, anti-jamming of the strong, the machine broke resistance, strong. Call clearer, can be installed with more of those headphones. 2. Cell standby time up to 5 day, normal conversation can have 2-3 days. High capacity 1800 MAH configuration of lithium battery. 3. 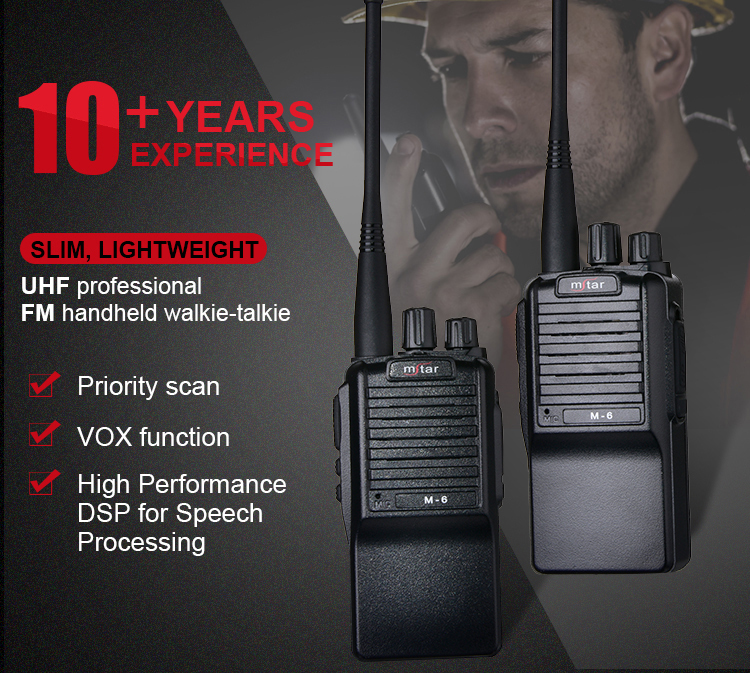 M-6 radio is a high quality of the commercial radio, accord with human body engineering principle, master and comfortable. For business customers with high quality communication experience. 4. Channel, power speech broadcast. 5. Multi-function, high performance. Full frequency, penetration ability strong, solid battery card clasp structure, the volume switch knob protection design.